Montagne Noire – Mazamet’s wonderful backdrop is the stunning Montagne Noire montagne range which, despite is name, is an oasis of green for most of the year with its deciduous trees and pine forests. Dotted with lakes, medieval villages and even vineyards and with a peak of 1,211 metres (Pic du Nore) the Montagne Noire is a year-round playground of cyclists, walkers & nature lovers alike. Lac de Montagnes – 7km from Mazamet sits the Lac de Montagnes, a peaceful setting with great facilities from a small sandy beach, mini-golf, snack bar, restaurant and, not for the faint hearted, l’Acro Park In the summer months a twice-daily free shuttle bus runs from just 200 metres from La Villa to the lake and guests are welcome to take towels and a cool bag to enjoy a picnic of items bought at the morning market. 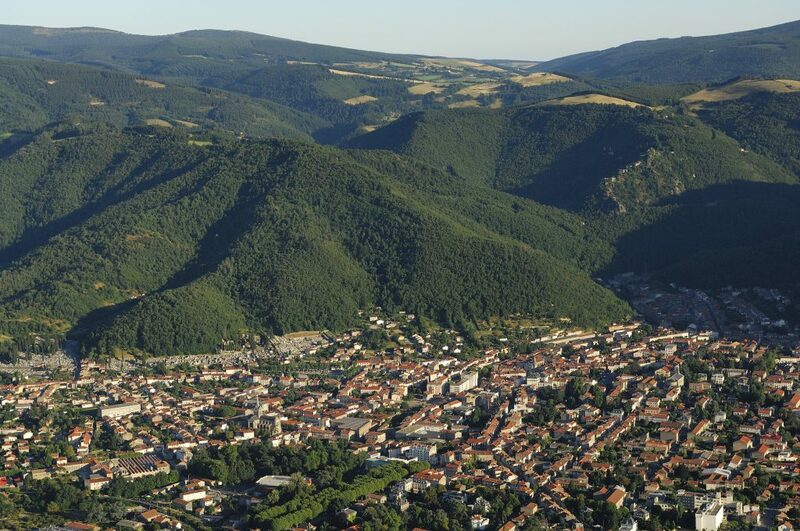 Hautpoul – origins of the town of Mazamet started with this unique medieval village which clings to a steep-sided valley in the Montagne Noire, just 5 km from Mazamet. Over 800 years of history, some of it very bloody during the 13th century siege by Simon de Montfort, a visit during your stay is a must to marvel at how the houses, castle and ramparts would have been built. Today the medieval gardens have been restored; there is an annual re-enactment weekend and a twice-annual night time candlelit walk organised by the office of tourism. You can also take a 90 min walk to Hautpoul from La Villa and enjoy lunch or a cold drink at the Taverne D’Hautpoul as a reward for the final steep climb! If medieval history is of interest, visit the Cathar Museum in Mazamet and commence you tour in Hautpoul of some of the amazing fortified villages and chateaux which make up the Cathar trail in the region. Markets – every week of the year there are at least three markets taking place in the centre of Mazamet (Tuesday, Saturday & Sunday) – the large Saturday market fills the streets close to the mayor’s office with fresh, seasonal produce, most of which is produced & grown within just a few kilometres of the Town. In the winter, from early November until late March, a Marché du Fois Gras takes place each Sunday and during July & August a wonderful Marché de Producteurs sees 15 or more local vendors sell food ready to eat (both hot & cold) with local wines, beers and desserts for visitors and locals alike to enjoy on a table to accommodate more than 200 people – a great spectacle and a great atmosphere too. Golf – One of France’s top 20 golf courses, La Barouge, is a short 5 min drive from La Villa. This 18 hole course is beautifully maintained with a unique 18th green where you need to chip across the road! Guests at La Villa receive a 15€ discount on the normal green fees too and lunch can be enjoyed at the restaurant with far-reading views over the fairways towards the Montagne Noire. Albi – just 45 mins to the north of Mazamet and La Villa sits the UNESCO World Heritage city of Albi with its awe-inspiring red brick gothic cathedral, the largest in the world of this style and dating to the 13th century. Adjacent to the cathedral, the largest collection of Toulouse Lautrec’s paintings outside of Paris are homed in a designated museum. A boat trip on the River Tarn, a stroll through the chic shops & boutiques, and a lazy lunch on the plaza in front of the cathedral make Albi one of the most popular day trips for guests staying at La Villa. Carcassonne – the same distance to the south of Mazamet as Albi is to the north, Carcassonne is another UNESCO World Heritage Site, specifically “La Cité”, the largest inhabited medieval walled city in Europe. As the second most visited attraction in France after the Eiffel Tower, expect crowds in the peak summer months – but taking our advice of arriving early in the day or after the tour buses leave late afternoon, a visit to Carcassonne, combined with the Canal du Midi which runs through the city, is a must. Walking – the choice of walks from the doorsteps of La Villa to a day out in the Montagne Noire or the Haut Languedoc National Parc are endless. Cycling – if cycling’s your thing, you have certainly come to the right place! Be it a gentile cycle along the Voie Verte (a 65km cycle path on the former railway line which brought the wool into Mazamet) – to the training route of local Tour de France cycle legend Laurent Jalabert, the roads around Mazamet are a cyclist’s dream. You can download & print a variety of cycle routes from the informative website of our office of tourism. Toulouse – with a regular train service from Mazamet to Toulouse (departing just 2 mins walk from La Villa) – a day out in the “pink city” with its great architecture, galleries, Michelin Star restaurants and Roman ruins are always a guest favourite. As the new capital city of the Occitanie region (the 2016 combination of the Languedoc and the Midi Pyrenees) Toulouse has much to offer – we highly recommend a morning’s walking tour with expat Penny, taking the excellent bus tour with audio guide of paying a visit to the home of Airbus and exploring how they make the A380 and their newest aircraft the A350.